Pretty! And it reminds me, I got a small faceted gem when I was in India. It’s a lot like this only it looks more bluish when you rotate it. When (if?) I finally get my stuff out of storage I’d love to get it identified. I’ve always wondered what it was. So I take it you enjoyed Tucson. I started at CVO yesterday and one do the discussions in the lunchroom was about the rock show. He said it was spread out all over town and he actually saw a fully articulated dinosaur for sale in one of the tents. Was it really crazy? Sure thing, I should have my equipment in the next two months so I can (in theory) ID it! I saw that dinosaur!! XD How odd! (There were also animatronic ones at the Hotel Tucson show.) I didn’t really go to that many shows, in the grand scheme of things, but yes, there was a tent with a triceratops head, a fully-assembled dinosaur (I want to say it was a mammoth), and some really amazing fossils. It was… WILD. I’ve never seen anything quite like it! My favorite part (aside from the AGTA GemFair and GJX wholesale shows) was a motel show where all the rooms were converted to gem shops. One was all fluorescent minerals! I’ll be blogging about it at length in the very near future. Will be giving you a call soon came home with more than I can handle!!!! Talk soon! BTW – I used this post on my Tucson Gem Show page on Facebook! Beast of a stone! Is that one of the new ones from the Oceanview Mine? I admit, it looks Afghani. I picked up four in the 20 carat range, one of which I’ll keep for my personal collection. Good luck on your studies, although I do not have my GG, I have a fairly extensive collection of rare gemstones, I displayed part of it in Tucson in 2010. Kunzite is one of my new favorites. I wish I knew the origin of the stone pictured; unfortunately, it wasn’t on the display label. Your website has a lot of beautiful things! Benitoite is on my list of things I’d like a small specimen of (faceted benitoite is lovely, but I think I’d prefer a crystal, since the shape is so unique.) You’re selling such great stuff, I can’t imagine what your personal collection must be like! Absolutely gorgeous gemstone! 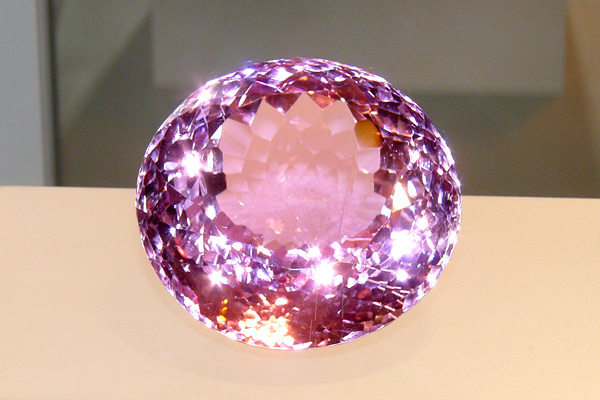 I also love Kunzite, even the clear variety…I must admit, I would love to have a stone of this water and size in my personal collection. Positively stunning.. Agreed, I’d be delighted if a stone like this were in my home. Welcome, and thanks for stopping by!